By the time this report is published, at least one 4D recording will have been in general release since mid-July: the Violin Concertos of Sibelius and Tchaikovsky, played by Gil Shaham with the Philharmonia Orchestra under Giuseppe Sinopoli. By late fall, most of DG’s new releases will feature the 4D technology, which has been part of the company’s working arsenal since last January. The sonic properties of 4D will also apply to the digital tracks of video laserdiscs which are original DG productions (as opposed to pro grams from other sources, such as licensed Unitels). One such LD to watch for in the fall is the highly awaited, full-length edition of Bernstein’s On the Town, led by Michael Tilson Thomas. 1) A remote-controlled, low-interference microphone preamplifier of proprietary design. Remote control allows the preamps to be placed in close proximity to the mikes to reduce transmission-line interference, and eliminates obtrusive interruptions by technical staff as all fine adjustments can be made from the control room. 2) A delta-sigma 62x-oversampling A/D converter from Yamaha with a claimed 21-bit resolution, a putative 32-fold increase over the conventional 16 bits. The conversion rate remains evolutionary. DG’s goal is to reach a summit of 24 bits. As Brian Stewart put it, “Humans can tell the difference between 22- bit and 23-bit conversion. They can’t tell the difference between 23-bit and 24-bit, the limit of human hearing.” He didn’t tell us just how, or on whose hearing, this had been tested as he held out the promise of perfect sound tomorrow. 3) A stage box/digital network principle. The mike preamps and the A/D converter are encased together on the stage floor, so that digital conversion takes place in close proximity to the performers, eliminating long analog cable runs to the control room, often a source of problems. DG claims a potential dynamic range of more than 144dB as one of the principal benefits of interference free digital transmission. 4) “Authentic Bit Imaging” and all-digital mixing utilizing the Yamaha DMC 1000 Mixing Console driven by DG’s proprietary software program. DG claims another exclusive: all-digital mixing of a fully digital transmission. There’s no going back and forth from digital to analog for signal processing or post-production, then back to digital—a practice more common than is realized. “Authentic Bit Imaging” (ABI), the means by which the 21-bit master is reduced to the conventional 16-bit consumer CD, involves dithering (the addition of low levels of noise). DG admits a kinship to the Super Bit Mapping (SBM) developed by Sony for the purpose of converting 20-bit masters to 16. It occurs to me that they could have gotten more than four D’s out of all of that, but maybe they’re trying to keep it simple. The recording process, as we experienced it, was anything but simple. We were first led into the balcony of the Manhattan Center Ballroom for the rehearsal. This was the first time I’d attended a rehearsal in which Mr. Levine was working with the orchestra that has been his own for some 20 years, and whose current expansion into concert repertoire and a wider sphere of activity is entirely due to his promotion. The musicians who comprise the MOO are as musically literate and experienced as those of any orchestra, but basic concert repertoire such as “Eroica” remains new to the ensemble Levine is counting on this factor to bring a freshness to their performances of this work and its oft-recorded companion piece, Schubert’s “Unfinished” Symphony 8. On this occasion, I was particularly impressed by Levine’s request to the woodwind players to, figuratively at least, sit on the edge of their chairs and to be as engrossed with the flow of the music during their rests as they are while actually playing. As a result, entrances which had been fractionally behind fell right into place. Beyond the music itself, I couldn’t help but notice the plastic sheets hanging from the balconies. This is standard practice by many record companies to create the illusion of more reflections, more ambience. I ask why. Manhattan Center’s own flyer describes the ballroom as a 9200-ft space of ornate baroque design. They’re not kidding. What would it sound like with all those curlicues and acoustic culs de sac exposed? The Sony Royal Edition Bernstein recordings, perhaps? I took the opportunity to notice what the decay sounded like when they stopped playing. The Scherzo ends with a resounding tutti stinger. Would you believe the last note was swallowed into “digital” silence, just as on a CD? The musicians themselves are experienced and disciplined recording artists who fall into silent stillness until released by the maestro. Yet I was not prepared to experience this effect live. I’m still pondering its implications. At the rehearsal’s conclusion we were taken to the ballroom floor, where the orchestra had been deployed, to be shown the setup. A pair of PZM mikes were attached to a pair of vertical plywood boards just behind the conductor’s podium, with the mikes about 12’ above the floor, the boards at a 45° angle Another pair of mikes were taped to the floor about 5’ in front of the orchestra, corresponding to the second stand of first and second violins, respectively. (At the Met, Levine prefers the once traditional, currently rare, antiphonal seating of first and second violins.) In addition, there were spot mikes for first and second violins, violas, celli, basses, woodwinds, horns, trumpets, and timpani. Our attention was then called to two large portable cases sitting in front of the orchestra. These were the stage boxes which contained the remote—controlled mike preamps, the A/D converters, and the digital network which transmits the signal through standard computer cable. They also contained the heavily shielded and interference-prone audio cable no longer necessary for those long runs to the control room. We were told that two more such stage boxes were behind the orchestra, four being needed to handle all the mikes in use. We were then ushered to the lobby area, which served as the control room. Here we were shown the Yamaha computerized DMC 1000 mixer, which anyone may purchase on the open market if they have enough money. In this instance, however, the Yamaha is driven by software developed jointly by DG and Yamaha for DG’s exclusive use. In addition to fully digital mixing, preamp control, and storage and memory functions, the ‘1000 contains some highly sophisticated DSP. This is where Tonmeister Zielinski began to wax most enthusiastic. The storage and memory aspects could allow virtually any degree of retroactive post-production or remixing in the frilly digital domain, with exact reference to what had been done previously. This type of facility is especially useful for operatic recordings in which all kinds of casting problems cause intervals of months to occur between taping sessions. The same philosophy applies to the adding of reverb or ambience beyond that which is already provided in the natural acoustics of the recording site, all of which the Yamaha DMC 1000 with the DG software can do better than it has ever been done. Finally, the playback. The crowning touch on the demonstration was the application of digital delay (or coordination) to eliminate the inevitable smearing caused by the differing arrival times of sound from the spot mikes and the main mikes. Listening over industry-standard B&Ws, we were given turns at the sweet spot for before’s and after’s. Brian Stewart had us psyched up for very dramatic differences. The uncoordinated version would seem flat and two-dimensional, he said, while the coordinated one would seem to leap out of the speakers with a stage image beyond and around the speaker placement. Most of us heard very little difference. At least one observer felt the sound was “more electronic” with the delay. I felt a slight enhancement in stage depth with the delay. It was certainly not the dramatic difference between mono and stereo, or conventional stereo and stereo with surround. Since the end of the movement wasn’t played for us, I was unable to compare my live recollection of the decay to that of the recording. The overall sound seemed more reverberant, and it was our understanding that some reverb had been added. As with all technological breakthroughs, there’s good news and bad news. The good news obviously stems from DG’s goal to make digital sound more like analog. Increasing bit rate and improving transmission lines are good ways to do it. Not unnoticed in this period of reductionism (DCC and MD) is DG’s policy to increase, not reduce, the quantity of information in mastering and storage so that ongoing improvement in the technology can benefit current recordings retroactively. Aspects of the 4D system can be applied to reissues, analog as well as digital, for more faithful conversions of analog material and improvements on early digital recordings. A Golden Edition of early digital Karajan recordings has already appeared in Europe and is due for US release in the fall. Reports are very good, especially with regard to such eardrum—piercers as Strauss’s Alpensinfonie and the 1983 Beethoven symphony cycle. The downside is the inevitable hubris that takes over the users of the tools. Mr. Zielinski is not an arrogant technocratic twit. But his remarks and observations reveal this very nice and able gentleman to be high on the drug of hubris. A word of caution for DG: Use your new tools well, but do not over use. We’ll be listening. Postscript: Just before press time, I received DG’s first—released 4D recording—Gil Shaham performing the Sibelius and Tchaikovsky Violin Concertos with Giuseppe Sinopoli and the Philharmonia (DG 437 540- 2; Klaus Hiemann, balance eng. ; Wolf-Dieter Karwatky, recording eng. ; Wolfgang Stengel, prod.). Ironically, the most relevant comparisons can be drawn from the 36-year-old first stereo recording of the Tchaikovsky by Heifetz/Reiner/CSO, as recently restored on RCA Living Stereo. Each recording preserves a convincing image of a flesh-and-blood violinist in the foreground. Heifetz seems no less real in the RCA recording than Shaham does in the DG. Neither is playing in a vacuum. Their sounds are nuanced by the respective venues, and involuntary body movements—in which the soloists shift their stances slightly—can also be savored. The difference lies in the renderings of the orchestras. In the RCA recording, the Chicago Symphony, with its crucial woodwind and French horn solo passages, is as rich in palpable nuance as is Heifetz himself; the strings, too, have a wide, soft “thereness?’ In the DG 4D, the Philharmonia seems less of a collaborator, more of a self-effacing generic accompaniment. Everything is there, but it lacks personality and character. Moreover, its imaging suggests a tunnel bounded by the speakers, whereas the CSO extends well beyond the speaker placement on the RCA disc. The central tutti in the first movement, a climax with brilliant trumpet figures, comes off as a study in the bland leading the bland. The trumpets in the RCA create a mood of bold heroism even while playing no more than a light forte. This could be a reflection of Sinopoli’s taste as much as that of the engineers, but it is in the miking. 8. There is some debate in the UK, led by the respected free lance classical recording engineer Tony Faulkner, about the degree of resolution achieved by DG’s 4D hardware. See Studio Sound magazine, June 1993, p.87. 9. Dorian Recordings was a pioneer in this technique—see Robert Harley’s interview with Craig Dory and Brian Levine in the next issue. On March 11th of this 1993, Deutsche Grammophon presented the UK professional audio press with what appeared to be a new era in audio recording systems. The impression was given that DG had stolen a march on its competitors. Far from being a staid old Teutonic lady relying on other manufacturers’ long—established recording systems (fabled for years to be Sony 1610 and 1630 A/D converters and Sony U-matic video cassette recorders), DG was, in fact, revealing strong activity in the design and development of advanced digital recording technology with their “4D” system? As this report will reveal, much of their work is sound, based on a good technological foundation and reflecting upward of $20 million worth of reequipping at DG. Better- sounding recordings are agreed to be the result; a number of recent reviews suggest that CDs produced with the 4D system have found favor with many critics. I’ve sampled the Boulez/Stravinsky Firebird and found it to be one of the most transparent DG recordings ever. Perhaps in their enthusiasm to tell the world how hard they’ve worked on this project, DG failed to clarify certain points which have since proved a major source of contention in the UK audio press. So much so, in fact, that the latest DG meeting was held with the specific aim of trying to clear the air. DG director Klaus Hiemann, the project architect, complained bitterly that they got critical comment only in the UK. It could be argued, however, that as London provides one of the highest concentrations of studio engineering and technical recording expertise in the world of high-quality audio, it is well placed to take a critical view when required. When it became apparent that some of the original technical details—such as 21—bit encoding and a 24-bit network—were proving a source of contention, DG’s publicity department swung into action. Unfortunately, instead of clearing the air they allowed a full-scale row to develop with some pressmen. All manner of acrimonious correspondence ensued, even to the point of veiled legal threats. As might be expected, this heavy-handed approach to press comment did no good at all. A hastily organized meeting on August 18 was welcomed by one and all as an opportunity to finally set matters straight. Anticipating the imminent public release, DG’s 4D recording package encompasses much of the recording chain. 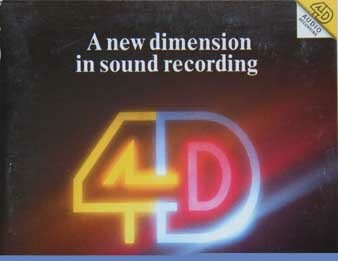 4D came about as the result of Klaus Hiemann’s dissatisfaction with established digital hardware, and stems from his personal goal of producing substantially better-sounding recordings. 4D is exclusive to DG; the technology will not be sold or lent to any other company or recording label. As much a philosophy as a specific system design, an upgrade path exists which will ultimately allow the high-definition promise to be fully attained in practice. In the atmosphere of increasing competition among record labels, some recording companies, in my view, have been applying descriptions to their recordings which could be described as misleading. Sony has recently begun using “20-bit” as a description for their recording technology. The “bit wars” have now spread to the promotional wings of the professional audio industry. (The con sumer industry is already heartily sick of the bit wars still raging in the consumer CD replay market.) Perhaps in a bid not to be outdone, DG announced this March that a key element of 4D was “21-bit” A/D encoding. Of course, it’s a coincidence that this is one bit better than Sony. DG also stated that the subsequent recording chain or network was “24-bit Little or no clarification or qualification was given for these figures, which are also to be found on the labeling of some CDs made with the 4D system, specifically the sampler and the Boulez Firebird noted above. A 32-fold improvement is claimed over the original CD standard. Here in the UK, DG’s claims were—to put it bluntly—not accepted by some members of the recording fraternity and some journalists. The resulting row has rather obscured other features of the 4D approach which are interesting and definitely important. Together with a very low-noise and low-distortion microphone amplifier, the analog-to-digital conversion is done most beneficially at the performance end of the chain, close to the musicians. D G engineers have designed an eight-channel “stage box” which allows the conversion to digital with short analog cable runs to the microphones. As Klaus Hiemann explained, “a key feature of 4D was the elimination of long mike cables in the analog domain, noise- and distortion-susceptible connectors, switch contact, the patch bay, and other studio components.” The exclusive “21—bit” A/D converters are in the stage box. The data line running from this box is to the AES/EBU 24-bit standard, sampled at 44.1kHz. 4D recording began early in 1993, but it now transpires that it was not until June that the full “24-bit” path was fully established to the digital mastering recorder, these now selected as Nagra 24—bit units. Up to this date, the 4D session tapes were in fact a mixed-down stereo format reduced to 16- bit; a PCM1610 controlled the U-matic tape cassette, the standard format for CD transfer. Thus it was a 16-bit “archive” version that DG’s engineers took back to base after a field recording session. When pressed on this point, DG said that they had never claimed better than 16-bit on the final recording stage and did not do so now; as such, it is hard to understand why such an emphasis was made of the “21-” and “24-bit” descriptions for “4D” CD issues. Another key element of 4D is a DG devised version of the noise-shaping and dither schemes being pursued by many researchers in order to get more subjective resolution into a 16-bit replay channel, given that superior, original recordings have a better than 16-bit content. Sony has Super Bit Mapping, Reference Recordings is using HDCD” from Pacific Microsonics, while Meridian has its own proposals founded on psychoacoustic principles. DG has its ABI (Advanced Bit Imaging). Low-distortion requantization and noise—shaping are used to squeeze a nominal 24-bit audio data channel (whether or not all the bits are in use) down to 16-bit, and attempt to carry across the maximum amount of music information—a laudable goal. In fact, this is not an unrealistic dream. Dither alone has the ability to erase the severe and audible black hole of digital distortion at the lowest signal levels around the least significant bit. We are familiar with graphs in which those massive steps in the linearity staircase at low signal levels are smoothed by dither, thus producing the ideal pure line. That line truthfully indicates that there is life below the 16th bit. In fact, with the correct dither, music signals may be cleanly recorded and reproduced at levels down into the noise floor, until they are totally buried in noise. Dither noise may also be chosen to sound smooth and innocuous, just like background hiss from analog tape. While much publicity has been given to related schemes such as Super Bit Mapping and their various attributes, consumers have been enjoying the benefits of higher- resolution dithered processing down to 16- bit CD for some time. For years now, Decca has been mastering with 18-bit AD Cs, employing very high dynamic range digital mixing desks, and has taken great care to get as much music as possible to the final 16-bit CD manufacturing tape. It goes almost without saying that they use precision rounding and dither to get this right. At DG’s August meeting, the UK audio press had their opportunity to question a DG technical panel on some details of 4D, as well as to try to clarify the terms used. 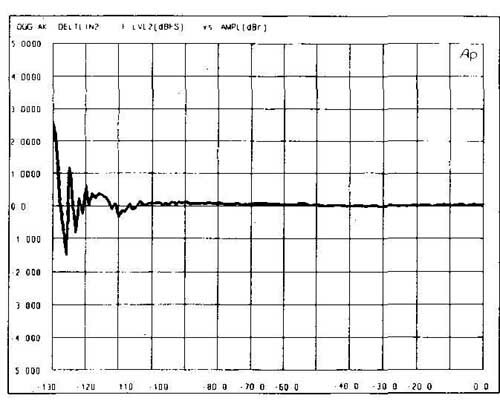 To help support DG’s case were a set of measurements and graphs taken on an Audio Precision test set. One matter which had to be resolved early on was a clarification of the 4D chain. The stage-box mike AID units were said to be 21-bit, the data paths (network) 24-bit in and out of the Yamaha MC1000 mixer console. The final stage consists of a dithered requantization down to a normal 16-bit CD cut ting master recorded on a Sony U-Matic. So far, so good. Next tame the thorny question of the 21- bit A/D: There is no known commercial chip that offers this performance, and DG is not in the business of growing its own IC chips. It was disclosed that two 18-bit Delta/Sigma ADCs are used in the Yamaha-built modules. (These are similar to those commonly used in 18-bit consumer DCC recorders.) In Yamaha’s development of their Hi-Bit system, previously seen in Yamaha CD players, the two chips are combined, in conjunction with level shifting, to achieve higher effective bit resolution. DG qualifies the 21-bit spec as “floating-point”; and, in fact, the third bit, or —18dB, level is chosen as the joining point for the two ADCs. One is operative at a maximum of 18-bit resolution when the signal level lies in the —18dB to 0dB range, full scale. Below —18dB the other chip is fed audio which is amplified by 18dB. This pushes its last, 18th bit further down into the floor of the input dynamic range by a factor of three bits, simulating a 21-bit overall result. DG admitted at the meeting that the actual dynamic range, and thus the effective number of bits at any time, was by definition dependent on signal level. In theory, it was some thing less than 18 bits for loud signals, and perhaps approached 21 bits for quiet ones. Fig.1 Original DG8X A/D Converter, quantization THD+noise floor in dBFS (vertical axis) vs input level of 997Hz tone (horizontal axis). Note step in noise floor at —18dBFS as second ADC cuts in. 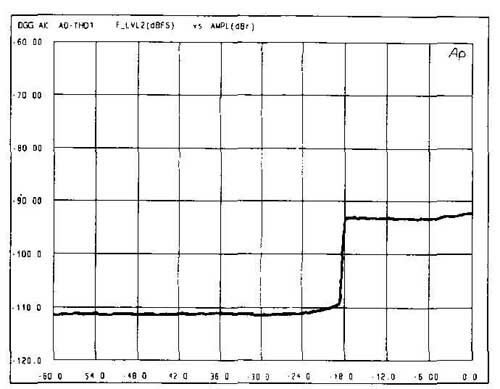 Fig.2 DG8X 11(“21-bit”) ADC, quantization THD+noise floor in dBFS (vertical axis) vs input level of 997Hz tone (horizontal axis). Note lower level of floor, step in noise floor at —18dBFS, and apparent loss of signal resolution above —6dBFS. 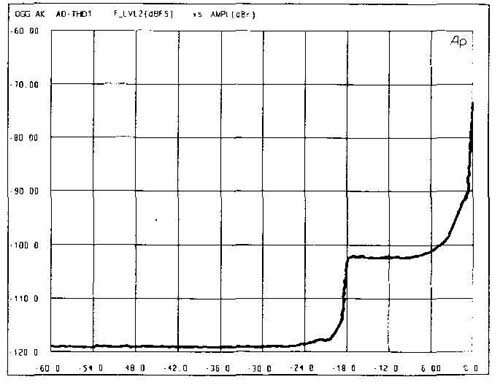 Looking at DG’s graph for the original DG 8x “21-bit” ADC (flg.1), you can see that the noise—and—distortion floor is located at around —94dB for signals from full level to —18dB. This is approximately 16-bit performance, 5 bits less than the claim. Below —18dB there is the expected “gear change” as the first ADC is switched out and the analog gain is enhanced. Now the second ADC kicks in, and its output is digitally resealed. There is a step transition to the second—level noise and distortion floor at —112dB. This approaches a 3-bit improvement, to 19-bit performance. On this evidence, DG’s “21-bit” description is misleading, in my opinion. Fig.3 DG8X II ADC, departure from linearity (1dB/vertical div.) using 997Hz tone. Note that, on a step-by-step basis with bandpass measurement filtering, the linearity error does not exceed approximately ±0.5dB down to —120dBFS, implying a close approach to 20-bit resolution. By August 1993, DG had upgraded these converters to an improved type, called DG 8 x 11 (fig.2). At 0dB full level, some kind of limiting is present which in theory gives a resolution figure of only 12.5 bits! However, it is also possible that this is a measurement or data glitch in the test setup. At a —1dB level we are probably in a more secure region, with a —90dB THD+noise floor; i.e., 15-bit resolution. Things improve gradually to a -10dB input level where the —102dB floor indicates 17-bit; fair enough for a theoretical 18-bit ADC, Delta Sigma or not. Again we see the expected improvement below —20dB, now to a superior —118dB floor. However, as can be seen from the linearity plot (fig.3), this is still a little less than 20—bit performance— once more, below the 21 claimed. Again, to my mind, a “21-bit” description is an over optimistic view of this latest, second system. In their defense, DG said that this was how the ADC manufacturers described the performance, and that other firms used a similar practice. Most of the press felt that two or more wrongs did not make a right. The 24-bit data chain was described by DG as a “network.” Accepting that more recordings are now being made on 24-bit— wide Nagra tape decks, there remains the question of the Yamaha digital mixers. Their internal architecture is 28-bit, and when a digital operation is performed—level control, equalization, or whatever—there is a limit to the final precision. Internal accumulators may fill up, and their output words are inevitably truncated. Moreover, the DG team agreed that their Yamaha mixers were in use both as single-unit and cascaded pairs. In cascade there is a further loss of numeric precision. It was thus agreed that, under certain conditions of normal use, it was unlikely that the final output would in f be of full 24-bit precision. In consequence, it was also unlikely under certain conditions that a 21-bit signal, assuming that you really did have one, would appear in full 21-bit precision at the output to the next stage, the 24-bit data recorder. Consequently, I think that the use of a global 24-bit description for the main part of the chain is confusing. Stefan Shibata of DG did say that a future target was a higher- precision console with as many bits as they could sensibly get. Questions were asked about the future of 4D, since it had been represented as an ongoing development program with a view to improving the quality of recorded archives for the future. Generally, DG’s view was, “the more bits, the better.” Firmly reiterating that their system was “effectively” 21-bit and really did sound better, the team looked for ward to a genuine 24-bit A/D, one inherently better than the theoretical dynamic-range limits for the analog input amplifiers. Under this condition, the A/D conversion process offers the ideal of no perceptible technical degradation to the input signal. DG stated that their 21-bit floating-point conversion design was the best currently available, but that if a 21-bit non-floating-point ADC emerged, DG would be the first to try it out. Floating-point is not favored per Se; it was simply a viable route to more bits which had been successfully developed by Yamaha. What DG does claim is that their special digital processing box combines the outputs of the two DACs in a way which renders inaudible that potentially awkward transition at -18dB. This may be true, despite my own and other engineers’ experience and opinion that changing horses at —18dB is not a wise move. This is a .critical region of the dynamic range where an awful lot is going on—the medium—volume area where music power resides. For example, most VU meters on traditional recorders do not have more than a 26dB working range. Transient edges, spatial clues, and timbre are all strongly represented in this volume region. Returning to the future of 4D, it was noted that it was DG’s intention to invest in digital mixers/control units with large internal architectures of greater precision to realize a consistently high 24-bit precision. Higher sampling rates are the subject of much research at present. Philips is experimenting at 88.2kHz, while the Mitsubishi professional open-reel recorder will handle 96kHz. DCS has a 96kHz ADC, while on the consumer front Pioneer has successfully manufactured a double-speed DAT deck running at 96kHz-sampling with an audio bandwidth clean to 40kHz. The results are promising and intriguing. At the August DG meeting there was a certain reluctance to discuss this subject, but finally Klaus Hiemann agreed that, in his opinion, and with hindsight, the 44.1kHz sample rate had been set too low. He agreed with his former mentor, Dr. Thomas Stock ham that 90kHz or more would have been preferable. The DG engineers felt that they could adapt their 4D system to work at doubled sample rates without too much trouble On the other hand, they did state that sample—rate conversion was not a trivial computation, and that there were unavoidable and substantial losses in signal quality in down-converting from 96kHz, or even from a second-multiple 88.2k to the present 44.1kHz CD standard. Other engineers present questioned this and felt that the benefits could well outweigh the difficulty. The ABI technical description was equally vague What follows is a quote from the press release: “… to shift audible noise into frequency bands where it cannot be perceived... Different noise-shaping curves have been found to be appropriate to particular kinds of music using different filter techniques and both correlated and non-correlated noise generation” (presumably whether the dither noise is random for the two stereo channels or is common to the pair). It was explained that, with correlated dither noise, the requantizing artifacts located at the center stage, where they were masked by the primary image. With uncorrelated dither, the unwanted sounds could appear concentrated at stage left and/or right and might be more audible. Interestingly, given that DG’s objective for 4D was higher—data-rate, higher-resolution recording, they categorically refused to comment on the new generation of data-reduced audio systems: DCC, MD, and the digital broadcast proposals. One has the feeling that commercial politics had effectively gagged them in this contentious area. Stefan Shibata did explain that the requantization technology was a matter of continuing interest since the perceived sound quality was more strongly dependent on some aspects than had been expected. For example, the particular stage in the noise-shaping loop where the dither noise was injected has a particular subjective value. Likewise, there are many possibilities when these are used in combination with frequency-weighted dither. There is not space to cover the theory of the subjective value of higher-resolution recordings properly equalized to 16-bit. However, the objective is clear: how to get more information through the 16-bit CD channel. It isn’t a bottleneck after all. These various dither and noise-shaping schemes open that closed door below 16-bit, allowing signal to reach down to 18-bit levels. The dither energy keeps the door open, necessarily present at the 15-bit level, and is shaped and guided to areas of the spectrum where it is not of audible significance. In practice, digital life is more complicated than this, but the more effective shaped-dither schemes do appear to be delivering the desired effect. NOTE: 4 Now at the University of Utah, Dr. Stockham laid much of the groundwork for the takeover of the recording industry by digital technology. His original Soundstream digital recorder was used in 1977 by Telarc to make the first American digital master recording for commercial release, Frederick Fennell conducting music for wind band. Sorry, DG, shame about the confusion, shame about the 21-bit A/D claim and the 24-bit network/mixer channels, and shame about the premature publicity concerning the technical performance which in some areas was only obtained with subsequent development. Most of all, shame it took so long to tell the UK press what 4D really meant. Now that we know, what was the fuss all about? Who could argue with a dedicated investment in better-sounding recordings? With a clear potential for the misuse of digital “bits” as some kind of horsepower specification, I plead to the AES to come up with some better definitions for bit resolution and dynamic range, whether scaled to peak level or some arbitrarily chosen lower level. Both the pro and domestic audio industries would benefit from the avoidance of such terms as “21-bit” and “oversampling” where these are used to give direct indications of sound quality. Surely terms such as “21-bit” and “24-bit” should be omitted from the CD sleeve notes of all companies, and DG should not unfairly be singled out.